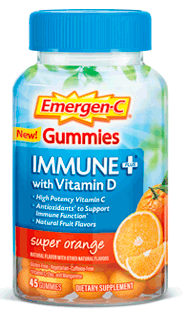 Emergen-C Immune+ Gummies Super Orange are an excellent source of Vitamins C and Vitamin D and with Zinc to help you feel the good. Directions: Adults take three (3) gummies daily. Do not exceed suggested use. Not formulated for use in children. Other Ingredients: Sugar, Glucose Syrup, Water. Contains <2% of: Annatto Seed Extract (color), Citric Acid, Grapefruit Oil, Natural Flavors, Orange Oil, Pectin, Sodium Citrate. Warning: As with any supplement if you are pregnant, nursing or taking medication, consult your doctor before use. Keep out of reach of children. Store at room temperature. Keep bottle tightly closed. Protect from moisture. Due to use of plant-based colors, gummy appearance may darken over time. This does not alter the product potency.